McLane Company has been a good customer. I have come to respect this company as being run the way a company should be. Always taking the high road. Here is a letter from Scott Harris. 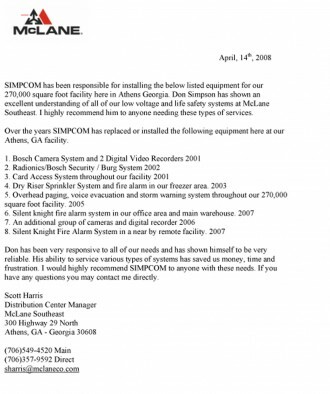 Don Simpson of AZ-Tech has done several jobs for me at Shepherd Center Hospital in Atlanta. In all cases, I have been pleased with his work. Don Simpson of AZ-Tech has shown an excellent understanding of all of our low voltage and life safety systems at McLane Southeast. I highly recommend him to anyone needing these types of services. I would like to thank you and all the other people at AZ-Tech for a job well done during the past year. You have promptly responded to all requests and handled the tasks very efficiently.